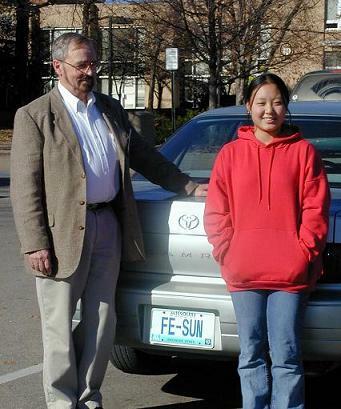 "My Early Days at the Imperial University of Tokyo"
after their trip to the 2002 Sigma Xi conference at Galveston, TX. "Report on the First Crisis in Cosmology Conference", Progress in Physics, p. 6, in press. "Professor Paul Kazuo Kuroda (1917-2001)", Geochem. J. 35 (2001) 211-212. "Paul K. Kuroda (1917-2001)", Meteoritics 36(2001) 1409-1410. "ACE Spacecraft Searches for Heavy Elements in Solar Energetic Particles." On-going discussion about the Iron Sun (Physics & Astronomy On-Line). Submitted for presentation at the Hirschegg 2006 Workshop on Astrophysics and Nuclear Structure, Hirschegg, Kleinwalsertal, Austria, 15 - 21 January 2006. The Nuclear Cycle that Powers the Stars: Fusion, Gravitational Collapse, and Dissociation ; O.Manuel, M.Mozina and Ratcliffe, H.
Submitted to the First Crisis in Cosmology Conference in Moncao, Portugal, 23-25 June 2005. Isotopes Tell Sun's Origin and Operation; O. Manuel, S.A.Kamat and M. Mozina. Journal of Fusion Energy, Vol.23, No.1(2005) pages 55-62. Submitted to "Proceedings of the 6th Workshop on Quantum Field Theory Under the Influence of External Conditions (QFEXT03)"
Origin of Elements in the Solar System 96 pp. address at the bottom of this web page. David Arnett, "Supernovae and Nucleosynthesis: An Investigation of the History of Matter from the Big Bang to the Present",Review: American Scientist 85, pp. 478-479 (1997). Diffusive Effects of Mass-Dependent Fractionation across the Isotopes of Magnesium in the Solar Wind; D.E. Ragland, O.K. Manuel. Thank you for visiting our web page and please come again! This page is the idea and construction of O.K. Manuel and K.Sumeet..